I enjoy going it The Fresh Markets to shop. True this fresh market does have a bit more limited beer selection than a lot of others, I guess craft beer is not quite as popular here as in other areas. The selection of brews is very similar to Harris Teeter, but at Fresh Market you can make a mixed 6 pack out of the singles whereas at Harris Teeter you can only buy 6 packs of the same brew. There is a Lowe's Foods on the North side of Pinehurst that has a good selection of brews as well and they also sell make your own 6 packs. At Fresh the lines at the check out are seldom long and the move fairly quickly, plus the other items in the store such as some good cheese, good breads, crispy fried okra, etc to eat with your beer. I wish they had a wider selection of craft beers to many non craft beers have made their way into the case. I always enjoy going in to Fresh Market stores. They are always so inviting and cozy. The staff always seem to be freindly and they all seem to enjoy working there. I grabbed a little coffee sample and starting to peruse the beer selection. I must admit, compared to most Fresh Markets, the selection was rather limited. There were only about 40 or so craft beer selections, but the overall beer selection was limited as well. The total beer "area" consisted of one large open faced cooler and that was it. This probably is the smallest selection of beer and/or wine I have seen at any Fresh Market. While the selection was small, it was broad and probably the best in the area. All of the larger stuff was there with locals like Natty Greenes and Red Oak. I cant say I was super impressed but there probably isnt much else going on, beer selection wise in this town. The Fresh Market could be a bit difficult to find. It has entrances off Morganton Road and off 15-501. 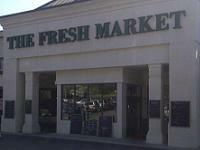 The store is very clean and well kept, as most Fresh Markets tend to be. Inside the beer is mostly in the cold case to the left or in front on floor display. At the time of my visit the floor display seemed to be occupied with closeouts and discounts with a few sale items. The BMC selection occupies the bottom row of the cold case, but the bottle count of the non-macro came in at 65 offerings which is pretty darn good for Southern Pines and the quality seemed pretty good. I'd certainly return to Fresh Market. With the only options being here, down the street at Harris Teeter, or some British Isle beers to go from The Squire's Pub, Fresh Market is a store to seek out.